You people are all sooooo young. I work at Home Depot and explained to my daughter how hectic it was last week before the blizzard hit. I told her that we sold out every single shovel we had and then I found one more in the back room. Naturally, several people were fighting over who would get it. 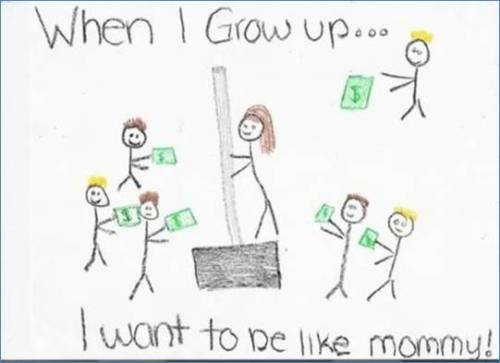 Her picture doesn’t show me dancing around a pole, rather, it’s supposed to depict me selling the last snow shovel we had at Home Depot. From now on I will check her homework more thoroughly before she turns it in. Very cute! Thanks for the laugh, Mo. "And in the third act, he has to fight a giant spider"
Just listen to the first 30 seconds to get the gist of the show, then go to 46:30 for a special treat.